The pace of ecological change is quickening and I see little sense of urgency to address the negative consequences that are unfolding. The increasing speed of change is a direct consequence of two interacting drivers – resource use and climate change. The long standing processes of human use of natural resources and resulting habitat degradation have increased in scale and impact as our population has continued to explode. Adding to this, as defense analysts have argued, climate change is both a primary driver and amplifier of change. Collectively these factors are driving worldwide ecosystem change at a pace and scale far exceeding any previous period of change in the history of our planet at least since the demise of the dinosaurs. Will Steffen and colleagues recently published updates of the famous “Great Acceleration” graphs, which showed major socio-economic trends in resource use from 1750 to 2000. 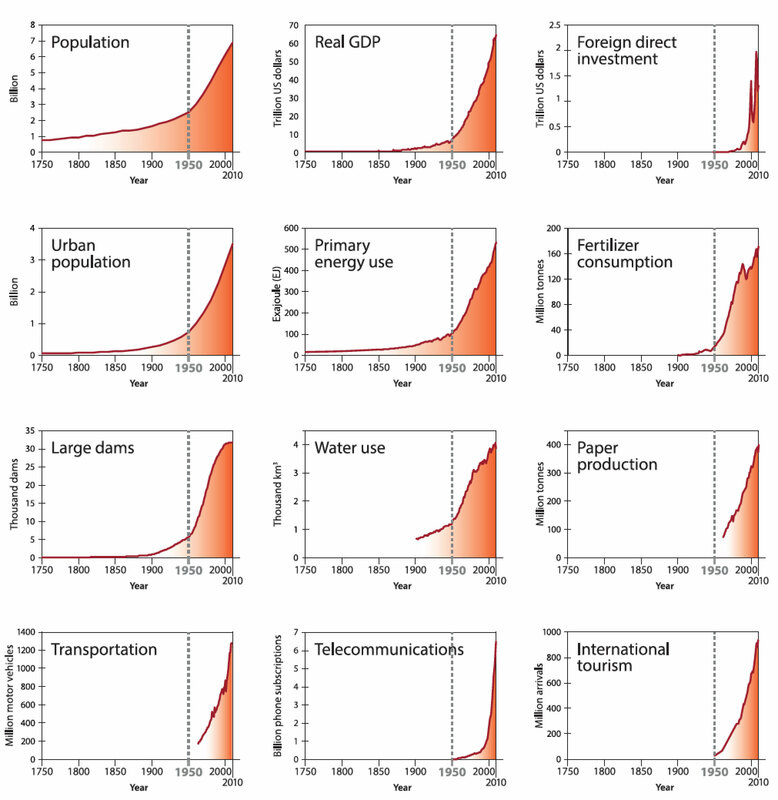 It is no surprise that none of these crucial trends show any evidence of slowing over the last decade (Steffen et al., 2015, Anthropocene Review 1-18). Although the starting point remains an issue for academic debate (Zalasiewicz et al., 2014, Quaternary International 1-8), there is little doubt that we have entered a new geological epoch whose hallmark characteristic is the impact of humans. The scientific community has declared this to be the Anthropocene epoch (my personal preference was for the term Homogeocene, but this never gained traction). All ecologists and natural historians who have lived more than few decades are painfully aware of numerous local habitats that have degraded beyond recognition in our lifetimes. Quite independent of the effects of climate change, we are watching these changes unfold so quickly that destruction can be essentially overnight. The legendary botanist, Alwyn Gentry, witnessed the now classic example of the loss of dozens of endemic species as a consequence of a single episode of logging at Centinela Ridge in Ecuador in 1978. This scenario is being played out with increasing speed on land and in marine habitats all over the globe as the Sixth Extinction ensues. Climate change significantly amplifies this steadily increasing loss. Although ecologists and conservationists have long understood these trends, it is disturbing to me that our institutions and government agencies seem to be clueless about how to manage such change. Simply put, we should be vigorously engaged in proactive adaptation. It seems logically axiomatic that proactive adaptation is far less disruptive and costly than is reactive adaptation. The water crisis in California is a case in point. For well over a decade, general circulation climate models have projected prolonged decadal drought for California and the American Southwest. For many years, the booming agriculture and population growth of the state have been on a collision course with dwindling water resources. 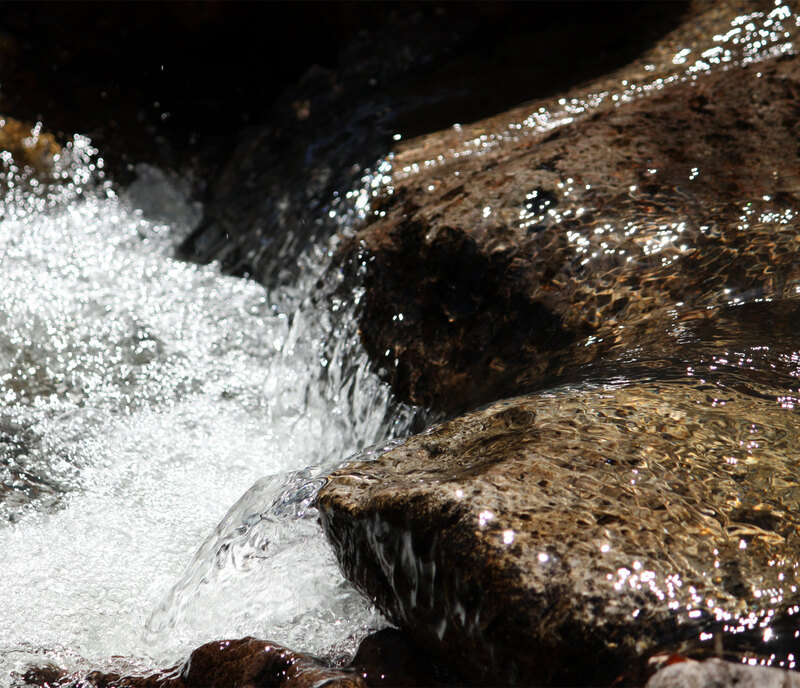 Recently, NASA data have shown that California has one year of water reserves above ground. The implications of this for human and natural systems are extreme. Had proactive adaptation been implemented a decade ago, this situation would be much more manageable and much of the pain of conservation and likely rationing could have been avoided. Most alarming to many ecologists is the speed at which climate change is impacting species and habitats. Evidence has been accumulating for over two decades that species are responding to climate change and shifts in growing zones (e.g., Walther et al. 2002. Nature 389-385). The implications of these studies are profound for the stability and predictability of ecosystems. Proactive management of forest, prairie, freshwater, wildlife, and marine habitats must begin now if we are to have hope of having viable resources in the second half of this century. Forests are an example of change that influences survival and reproduction of tree species within the lifetime of individual trees. The management challenges posed by this speed and degree of change are manifold. When I was a wildlife student at a big university in the Midwest, I was taught that construction of nature preserves was the best approach to ensure the longevity of species. Now we see that the growing zones are on the move and are increasingly decoupled from the species at the base of the food chain. As this decoupling progresses we can expect many preserves to be located in climate regions that are inappropriate for their various conservation functions. Without aggressive intervention, we can expect widespread transformation and even outright failure of species interactions and functional processes within ecosystems. Clearly, we need a much more dynamic and proactive approach to conservation than was typically assumed in the 20th century. The specific tools and approaches for such dynamic conservation remain nascent in their development at our major research institutions. To respond to the need for proactive management we must refocus public funding to provide strong incentive for research and implementation of adaptive management specific to this new paradigm of change. For example, habitat corridors connecting protected areas will become an increasingly important conservation tool as climate change ensues. The theory and practice of habitat corridor establishment and development are only superficially understood. Similarly, we must more fully understand the complex process of assisted colonization so that we can move species as their preferred habitat changes or degrades. Indeed, it would seem that we must re-examine our understanding of invasive species in this brave new ecology. Unless we make the development of such tools for proactive adaptation a top priority, we will certainly lose much of our natural heritage. Indeed, our children and their descendants will live on a depauperate and diminished planet. My recommendations and concerns are only relevant if we can mitigate the causes of climate change before midcentury. Although management of human use of natural resources has always been an urgent need, climate change has increased the stakes and made the costs of inaction staggeringly high. An increase of more than 3-4˚C above the preindustrial global average is unthinkable. If we don’t manage and effectively halt emissions of greenhouse gases, there is little that sophisticated management can do to stem the impending losses. I am struck that many of those working hard to move governments and corporations to address climate change are simply unfamiliar with the concept of ecological change. It has not been part of their training or thinking, and thus they focus on the impacts of climate change on human engineered systems. This is extremely short sighted given that all human systems are ultimately tied to our planetary ecology. As pointed out by Sir Nicholas Stern, climate change is the greatest market failure in history because there is no legitimate way to externalize this cost. We stand at a crossroads for civilization. It remains to be seen if we can accept the reality that we are of, and not separate from, the Earth. As Bill McKibben pointed out in his landmark The End of Nature, there remains no place on our planet that has not been touched by the hand of humanity, often with devastating consequences for living systems. Despite this widely understood reality, we continue to act as if we can, with impunity, fundamentally alter the life support systems of our home. David Orr pointed out in his indictment of politics in the US, The Last Refuge, that contrary to conservative claims, most of the major predictions of ecologists have turned out to be correct. Today the warning signs could not be more clear and the outcome more crucial. We can continue our zombie walk into the future, ignoring the data from well established science, but this time the consequences will be irrevocable on a millennial timescale.